Valentine’s Day is upon us! It’s not too late to surprise your love bug with this red velvet cake. It has some spice but it’s not hot. The chili powder adds a unique layer of flavor. 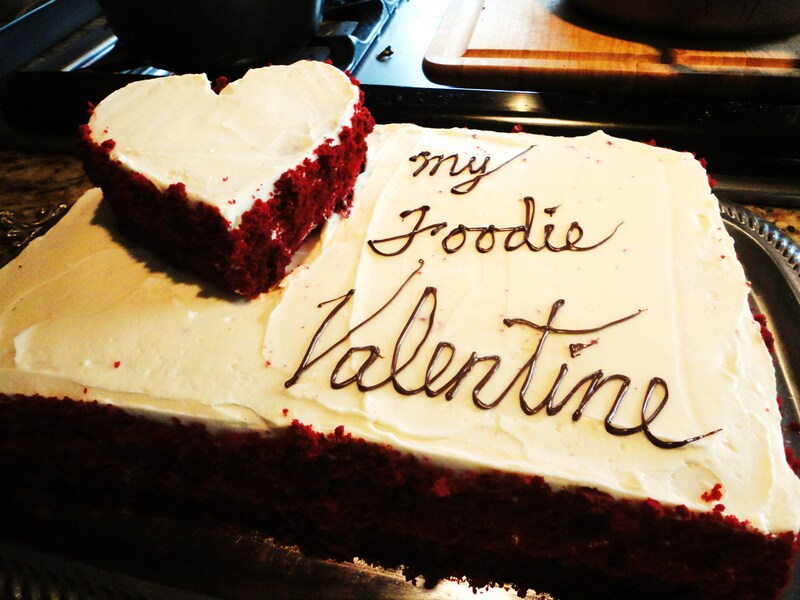 We made this cake for our My Foodie Valentine Tasting with help from the Nestle Kitchens. Preheat oven to 350°F. Pour a teaspoon of melted butter into an 11” x 15” cake pan. With a dry pastry brush, brush the bottom and sides of the pans. Line the bottom of the pan with a piece of parchment paper. Run the buttered pastry brush over the top of the parchment as well. In a clean large mixing bowl place the oil and sugar. Using a hand mixer beat at medium until well incorporated. Beat in the eggs one at a time until well incorporated. 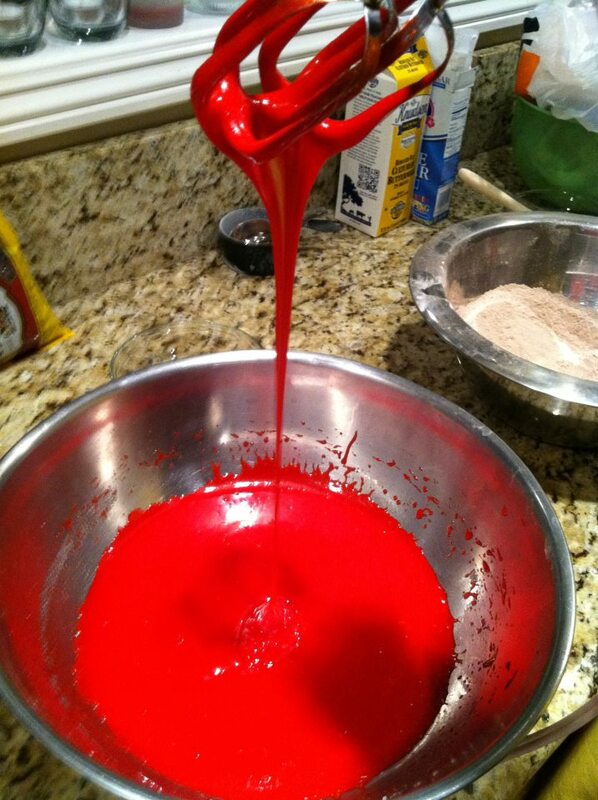 Reduce to low, and mix in the food coloring and vanilla. Food coloring stains so take it slow. Alternately add the sifted flour mixture and the buttermilk. Continue mixing in the remaining flour & buttermilk in batches just until they are both well incorporated. Don’t forget to scrape down the sides and bottom of the bowl. Place the baking soda into a small bowl/cup and stir in the vinegar. With the machine running add to the batter and just beat for 20 seconds. Using a serrated knife, even out the top of the cake by skimming the surface. (You can skip this step if you don’t plan on garnishing with red velvet crumbs.) If you need to, you can dry out your crumbs by placing them in the oven for a few minutes. Frost the sides and top of the cake with the yummy Mascarpone frosting.. Garnish with crumbs of red velvet cake. You can also garnish with Red Hot candies. Blend together the cream cheese, mascarpone, and vanilla until smooth and well blended. Add powdered sugar (in small batches) and mix well. In a clean mixing bowl and with clean beaters, beat the heavy cream with a hand mixer until you have medium peaks. Fold into the cream cheese mixture. You can wrap and refrigerate until needed. Note: I used a large cake pan because I needed to feed a lot of people. You can easily split the batter between three round cake pans or even cupcake tins. Adjust baking time accordingly. Remember you can also freeze your cakes. The pictured heart was made with a small round cake pan and trimmed with a large cookie cutter.